During the Certified Online Training Professional course, one of the core concepts I encourage is blended learning (combining online digital media with traditional classroom teaching concepts). Specifically, there's great value in integrating eLearning (asynchronous training) with live (synchronous) training by providing access to eLearning content from within the virtual training space. Published eLearning content can typically be provided to online students via a Materials pod or direct link (URL) you type into the Chat pod. All of the main training platforms (WebEx, GoToTraining, Adobe Connect) provide Chat and Materials pods, although they might give the pods different names. The problem with sending students outside of the training space to engage with eLearning content is that the student leaves the virtual classroom. Once your learners are outside, good luck getting them back. In my experience using many of the online training platforms, only one of the vendors offers a truly integrated blended-learning experience and allows you to share eLearning content directly from within the training room, and that’s Adobe with its virtual training platform Connect. Here’s how you can share eLearning courses from within Connect. 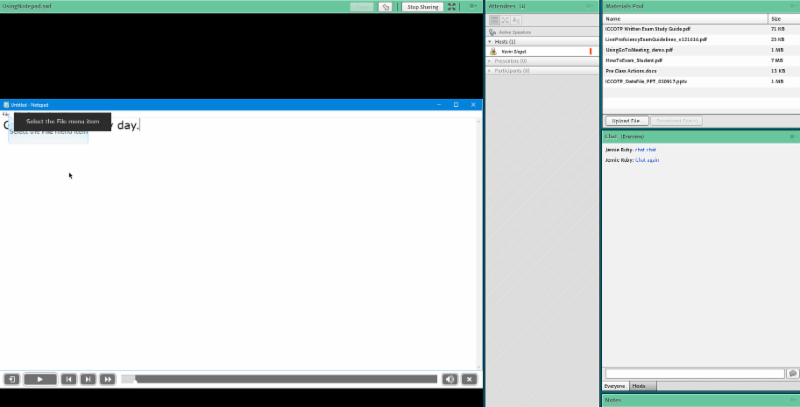 First, create the eLearning content in Adobe Captivate, and then publish as an SWF. 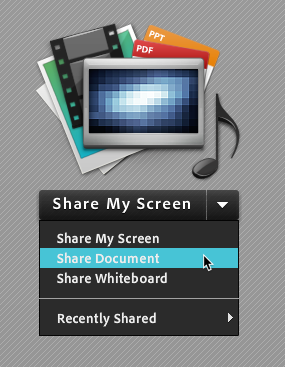 From within Adobe Connect, choose Share Document. Click the Browse My Computer button and upload the SWF you published with Captivate. In the image below, I’ve already uploaded a SWF I created with Captivate called UsingNotepad. Once you’ve uploaded content, it stays in the Select Document to Share area so you don’t have to upload content again and again and again. All you need to do now is click the OK button and everyone in the virtual room will not only see the eLearning, they’ll be able to interact with it independent of the other attendees. The ability of virtual attendees to work through the eLearning content independently is so cool, it's the one feature that might encourage you to select Adobe Connect as your training platform above others... and Adobe Captivate as your eLearning tool. If you’re thinking about going the Connect route, head on over to Engage Systems, tell them your friends at IconLogic said hello, and then ask for a demo of Adobe Connect.